Phosphorus (P) is an essential macronutrient for plant growth and development. Inorganic phosphate (Pi) is the major form of P taken up from the soil by plant roots. It is well established that under Pi deficiency condition, plant roots undergo striking morphological changes; mainly a reduction in primary root length while increase in lateral root length as well as root hair length and density. This typical phenotypic change reflects complex interactions with other nutrients such as iron, and involves the activity of a large spectrum of plant hormones. Although, several key proteins involved in the regulation of root growth under Pi-deficiency have been identified in Arabidopsis, how plants adapt roots system architecture in response to Pi availability remains an open question. In the current post-genomic era, state of the art technologies like high-throughput phenotyping and sequencing platforms,“omics” methods, together with the widespread use of system biology and genome-wide association studies will help to elucidate the genetic architectures of root growth on different Pi regimes. 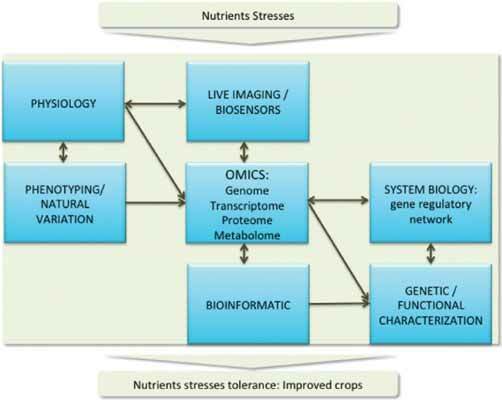 It is clear that the large-scale characterization of molecular systems will improve our understanding of nutrient stress phenotype and biology. Herein, we summarize the recent advances and future directions towards a better understanding of Arabidopsis root developmental programs functional under Pi deficiency. Such a progress is necessary to devise strategies to improve the Pi use efficiency in plants that is an important issue for agriculture. Phosphate, Root, Genes, Signaling, Crosstalk. INRA, UMR Biochimie et Physiologie Moléculaire des Plantes, Campus INRA/SupAgro, 2 place Viala, 34060 Montpellier cedex 2, France.